In our previous article "Nurturing independence - " we briefly discussed the issue of self management expected of our young children. In this article we explore deeper how we can find a balance between nurturing independence and nurturing connection. The environment is prepared for the child to do be able to do for themselves. We totally agree, and Dr Montessori’s words sum this up concisely when she says, “the essence of independence is to be able to do something for one's self”. What we see happening often is an interpretation of independence that encompasses all areas of a child’s life - emotional and social independence too. In the name of ‘independence’, young children can be left to deal with emotional upsets or social difficulties when they are just not experienced enough or emotionally ready to do so. Resilience is an interlinked term for letting a child solve their difficulties, and yet again, we need to be careful that either of these terms are not being translated as children ‘needing’ to learn to deal with things on their own. When we listen to our hearts, it is ok to question whether there are times this independence stance goes too far? Interpretations can be so very absolute, and there doesn’t seem to be an understanding that children can be both things - independent AND nurtured, and we can allow for independence AND support. We lose a sense of balance when we take one aspect and apply it to every single area of development. Being emotionally independent in the preschool years is not realistic. Children need our help to identify, name and work through their emotions. We realise this if we pay attention to the now, but so many adults hold only a long term view. They see help given to a child as limiting their independence and in turn, creating a dependency with no expiration date. What they are missing is the fact that a child who is helped emotionally in their youngest years will have a much stronger bank of emotional stability, resilience and self awareness to draw from in their later years. Then independence in all its forms comes from a core of capability, rather than from being left to their own devices and having had to struggle to find a way through. Even with the inner drive for independence that young children have, no one wants to stand on their two feet ALL the time. It’s exhausting, and doesn’t meet another key drive - that for connection on a very regular basis. 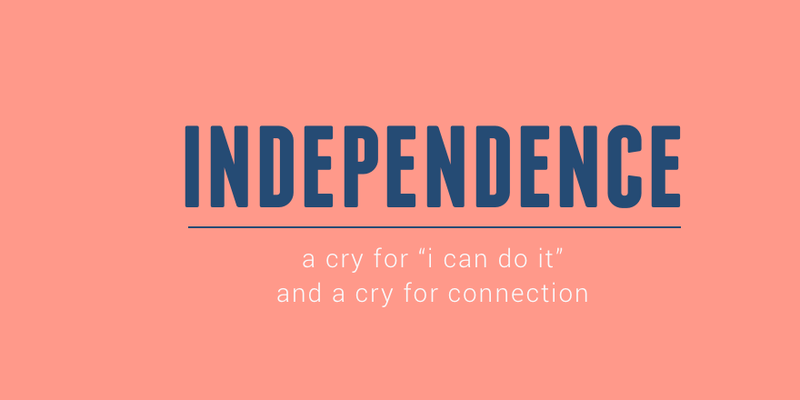 Just as we hear cries for independence, (“I can do it”), we hear cries for connection. This is often when children ask us to do things for them that we know they can do for themselves. This is a cry for connection, rather than an easy way out for them. We can tune in to this, and still allow their autonomy with the task they can manage, but take the very next opportunity for them to be the recipient of our care. It is not only ‘OK’, but perfectly wonderful for children to feel totally nurtured. If we jump on the ‘independence bandwagon’ we forget that acts of service are also an act of love. We forget to put ourselves in the child’s place, yet we should remember that as adults, of course we can make our own cup of tea, but isn’t it a lovely feeling when someone delivers you one? Just to be totally clear, we are not denying the importance of independence, either in your programme or in responding to a child’s true nature. What we are saying that being autonomous in their actions is not the same as being expected to be overly independent in dealing with social and emotional unrest. Some children are more resilient by nature, but it should not be seen as the ‘best thing for the child’ to be left to struggle through their emotions without support from a caring adult. As always, observation is key, as is an individual approach. Each child needs to be responded to as they are right now, not in some preparation for how we want them to respond in the future. Independence in meeting care needs empowers a child. It shows them we have faith in them and their competence. This just does not translate in the same way when it comes to emotional needs. In this situation, a caring adult and a listening ear empowers a child. It shows we are there for them, and that we are willing to help them grow in their own competence, in their own time. Newer PostA home away from home - what does this look and feel like?